Left your heart in San Francisco? No need to fly back to the golden coast to retrieve it! 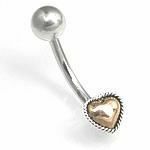 Put it in your belly button for safe keeping with our Golden Heart belly button ring, handmade with the finest materials. Check out matching Bali Earrings.